I want to welcome you tonight to a dinner which remembers a terrible event and a very dark period of history. Tomorrow, we will all gather at, perhaps, one of the most infamous pieces of ground in the entire world, Babi Yar. We will remember the brutal slaughter of 10s-of-thousands of our people killed for only one reason: because they were Jewish. But at the same time, tonight, we also celebrate the resilience of the Jewish community of Ukraine, and we look ahead. I want to thank President Poroshenko for hosting this important event tomorrow. This could not have happened without hiss leadership, the support of the Ukrainian people, and we are grateful for that. After 75 years, the ravine just outside of Kiev now looks peaceful and quiet. But 75 years ago, it was certainly not peaceful and it was not quiet. 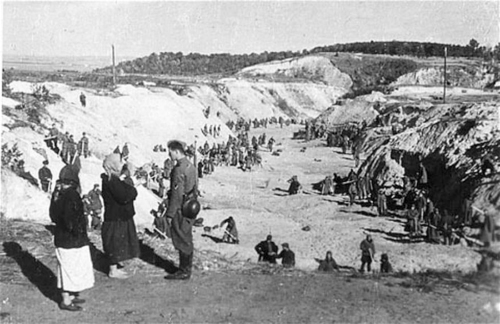 In a brutal war that was filled with terrible, terrible crimes - really inhuman crimes - the mass slaughter of the Jews of Kiev and others at Babi Yar that was organized by the SS and the German Army still stands out. 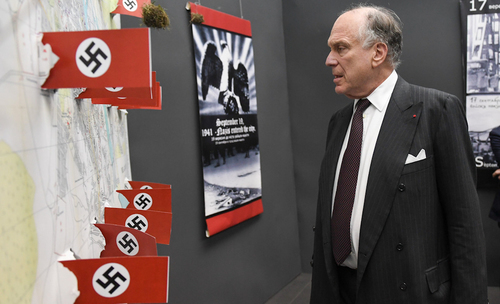 And while Babi Yar was organized by the Nazis, there were willing helpers in the Ukrainian militia. This happened all across Europe. In almost every occupied country, local people helped the Germans round up their Jews. In some cases, the locals were even more enthusiastic in their killing than the Nazis. And that is what happened at Babi Yar. 75 years later, we are here to remember everything. We are here to try to learn lessons from this horror. At the same time that we remember Babi Yar, we also remember that there were Ukrainians that joined the Red Army and fought the Germans.There were Ukrainians that risked their lives to save their Jewish neighbors. And we are here in Kiev for one more important reason: We are here to celebrate the rebirth of a strong Jewish community here in Ukraine. This rebirth is nothing short of a miracle. Just 25 years ago, during the Soviet era, Jews here in Kiev were not allowed to practice their faith and they were singled out with by the Soviet government because they were Jewish. Jews could not teach their children about their religion. Jews could not study. Jews could not pray together. They could not celebrate any of the rituals of their religion without fear of being thrown into prison. But at that time, there were many incredibly brave people stood up to this intolerance and risked everything their jobs, their health and what little freedom they had because they wanted one of the basic human rights the right to choose their God and practice their religion. We called them “refuseniks” because they refused to give up their Judaism. They refused to surrender to the Soviet regime. And we are still in awe of their courage 30 years later. So tonight we mark this tremendous change. We see a thriving Jewish community here that celebrates Bar Mitzvahs, and weddings, and Brit Milah. There are Jewish schools where Jewish children learn. Parents no longer live in fear when they teach their children. Who would have believed this? We also want to thank the Ukrainian government for its continued support of the State of Israel. We see the tide turning. Prime Minister Netanyahu talked about this at the United Nations last week. Countries are breaking with the old Soviet Bloc and the Arab states and are no longer just reflexively condemning Israel. Ukraine was ahead of this trend, and we greatly appreciate this. In a way, this dinner is mindful of an important Jewish tradition. We cannot forget the tragic and brutal killings that took place here 75 years ago. We remember the difficulties that Jews faced here under the Soviet regime. We remember the dead. But, we are Jewish, and so we will always look forward and hope for better times. We are here in Kiev tonight with a strong and growing Jewish community. To the Jews at Babi Yar, to the refuseniks, that would have been a miracle. That is what we celebrate tonight: the miracle of the rebirth of the Jewish community of Ukraine. I want to congratulate Ivan Dzyuba for being the recipient of the Sheptycky award, an award that honors this man’s great moral courage. To all the members of the Ukrainian Jewish community here in this room, thank you so much for joining us here, thank you for all your important work. And never forget: There is a large organization with representatives around the globe called the World Jewish Congress. It will never forget you are here. It will always support you. And it will stand by you.